During the rainy season our garden turns into a real Jungle, sheltering some of the weirdest and prettiest creatures alike. A couple of times I came across some insects that looked like branches and some dangerous looking frogs with a red line on their back where sitting in the broad day light undisturbed by our hovering presence. Then there are yellow, dotted, striped and differently shaded butterflies honoring us with their presence while the squirrels are entertaining us with their communal food fights. Also chatty Parrots like to take a round above the Jack fruit and mango trees, while the water snakes are lurking for tiny frogs in the under ground. Let’s not forget the variety of hard working ants too, cleaning up each and every corner in an instant. While you are here, just take a moment and crouch in our mini jungle besides the avocado trees, lemon tree and countless Tulsi bushes and just listen and keep an eye out for the world around you. You will discover that each little spot is taken temporally by some kind of harmless beast. You are surrounded by humid and warm air. Sharpen your senses and you will take in the beautiful refreshing aroma of the vivid green Tulsi leafs and then you will wish you had no responsibilities left in this world, that you could just dwell for some more time or at least until the red Indian sun disappeared in the horizon. If I could, my dear reader, I would gladly take you to the Goan world in the very same instance while you are reading the lines. For the moment my words will have to suffice to transport you to the Indian lands. We will have to wait for some genius to come up with a “smelling” system for the Internet or beaming a la Star Trek would do as well, as long as you could experience the lively smell of the glorious holy basil, the Indian Tulsi. 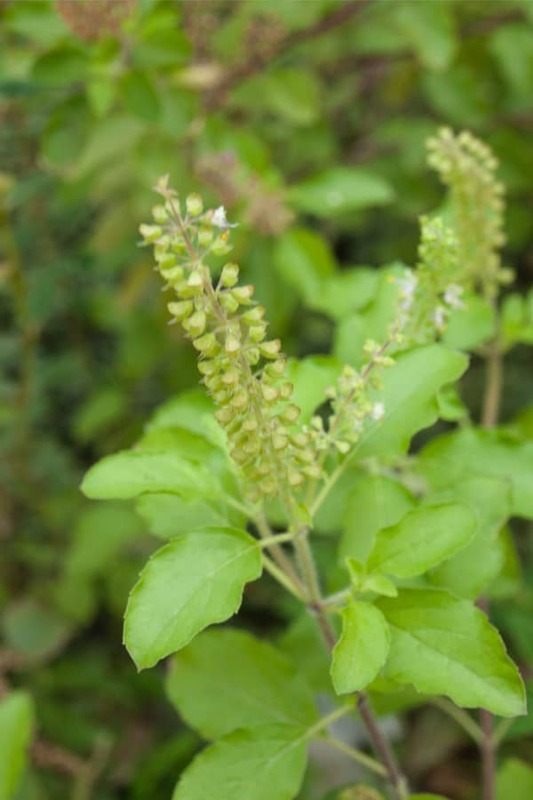 Tulsi has countless health benefits and it’s regarded as a holy plant in India. It is said that the tulsi brings good luck to a house and it wards of the evil. When we moved into our little house with the grande garden, we decided we needed absolutely a few Tulsi plants. Not because we were superstitious or mystic believers, no, we needed Tulsi to keep the garden fresh. Also we had been told back then that Tulsi repels Mosquitoes, so that was reason enough to keep some growing around. We nourished the 2 plants that a friend of ours gave us and we took care of them until the branches turned into wood and the plants started to dry up in the summer. Then they were gone… But they had left a whole load of seeds to sprout on the ground and of course the wind transports everything and so we ended up owning more then 50 plants at the same time. Once the rainy season is in full swing, the tulsis grow faster and stronger and that’s when I can’t keep up anymore with the trimming of the dried flower seeds. You see, the Holy Basil’s flowers need to be trimmed so that the plant grows thicker and stronger. If we don’t do that they turn woody and unhealthy. So it came that at the beginning of the monsoon season I had trimmed the whole lot, including the first 2 young leaf sets, and the result were a few baskets full of wonderfully smelling Tulsi leafs. What a bounty! 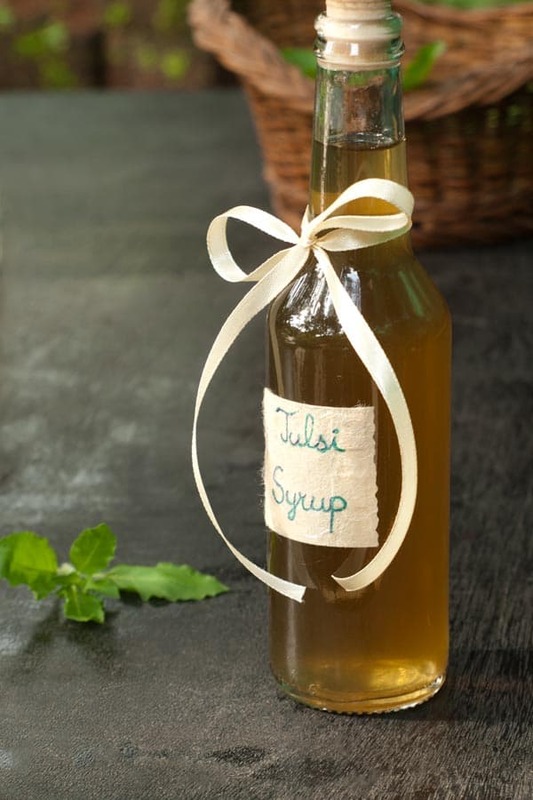 Light and refreshing homemade Tulsi Syrup. I like to drink it it when I feel dehydrated during summer time. Rinse your Tulsi leafs before cooking so to get rid of all impurities. Grab a pot, add all the 350 milliliter Water and the leafs and let it cook on a slow flame until the first boil. Remove from the heat and cover. Let the Tulsi leafs sit in the Water for 20 minutes at least. Strain the liquid and press out all the juice from the leafs. Discard the leafs and add the Tulsi flavored Liquid back into the pot together with the 120 grams Sugar. Keep on a low flame and mix until the sugar is all dissolved. Then keep for another few minutes on the heat until the first boil appears. Close the heat and just let the sugary syrup sit until it has cooled down. Strain if necessary again to get rid of any impurities. Grab a sterilized bottle and fill with the syrup. Seal well and store in a cool and dry place. Can be kept for a few months if stored in the fridge. Dear Reader tell me, have you ever made syrup at home and what was your experience? A lovely syrup…my problem with syrup is that I hardly use it…made some mint syrup last year….end up throwing it away.. I LOVE the flavor of holy basil! I just wish we could find it here! Really interesting post! I’ve not made this sort of syrup before, but it sounds intriguing. And tulsi sounds like it has some many benefits. I know I’ve seen holy basil at some nurseries before, but not often. I should go look for it, or ask my favorite nursery if they can source it for me. Good stuff – thanks. I helped make maple syrup when I was a kid but no syrup since. 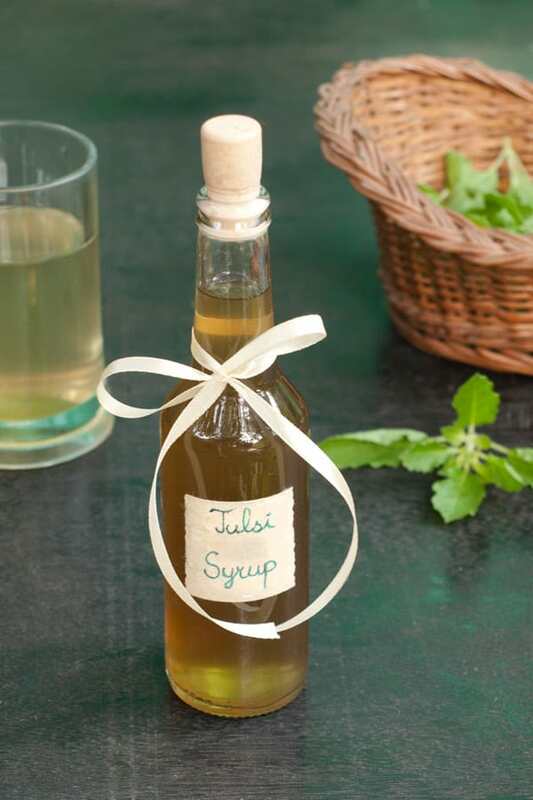 This tulsi syrup sounds pretty good, Helene! Love tulsi and I miss it so much here. Love the idea of the syrup and the pictures are so lovely Helene. Lovely way to preserve the herbs.. Such a great plant with awesome medicinal values & so abundantly available in India ! I don’t know Helene, how true it is that tulsi brings good luck but I believe in this belief or call it superstition and keep a tulsi plant in my home just like Hindus do. Its hard to grow here but I keep it on my kitchen window sill and use the leaves sparingly. I have never made tulsi syrup but yours is a good recipe to start. By the way you describe it, I would say that your garden IS a jungle. What fun to walk through all of those plants, bugs, and scents. With the way technologies are moving, one day soon we’ll have scratch and sniff screens and then I’ll be able to smell the tulsi plant. Love making simple syrups with with wonderfully scented herbs. So quick to make?! Such a gorgeous colour too. I’ve made syrup before – hazelnut syrup… turned out gorgeous, but perhaps not as strong in flavour as I wanted… was very sweet. Have been meaning to try again. I was thinking about the expiration of the syrub, but you cleared my doubts, It can be used for at least 6 months as you are saying 🙂 thanks for good information. really nice and informative recipe..